SKU: VBM-402. Category: Ding & Dent. Tag: World War II. Welcome to Mercenary Air Squadron World War II Mediterranean Theater of Operations! 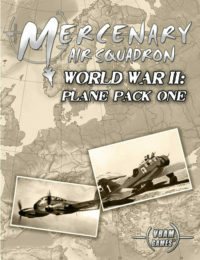 Here you’ll be able to manage a squadron with some of the most famous warplanes in history. In 1936, as the Spanish Civil War heated up, representatives of Spanish Republicans begin hiring American pilots to fight in the war. The Yankee Squadron, led by Bert Acosta, fought Franco’s White planes. Each pilot was paid $1,500 a month and a bonus of $1,000 for each enemy plane shot down. 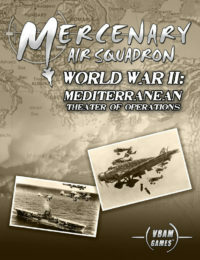 Mediterranean Theater of Operations takes this idea of mercenary pilots from the Spanish Civil War and run with it. You can form a squadron from any time from just before the start of World War II to the end of 1943 and see if you can prosper from the chaos. Ownership of Mercenary Air Squadron is required to fully utilize the contents of this product. Be the first to review “World War II: Mediterranean Theater of Operations (Ding & Dent)” Click here to cancel reply.